With Missouri’s turkey season right around the corner its time to think about getting your gear ready for the annual pursuit of a big spring gobbler. Turkey hunting is a challenging sport and it’s imperative to be prepared. 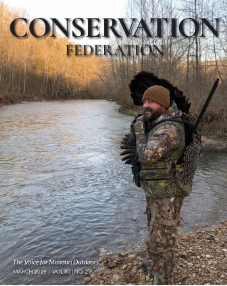 Although we can’t control the weather, hunting pressure, hen interference, or any host of other obstacles, we can have our gear in shape and ready to go. Go through your turkey hunting clothes and make sure everything is in good shape. Did those boots leak last year? If they did, sitting in the closet all winter didn’t make them any better. Replace any clothing items that are worn out, or faded to the point that they no longer qualify as camo. Be sure and wash everything, especially facemasks and gloves. It’s good to have extras on hand. Turkeys have keen eyesight, so faded out clothing will make you stand out when you’re trying to blend in. Don’t forget to add a packable rain suit to your gear. I seem to have a knack for bringing rain every time I head to the woods, so it’s nice to be dry. I’ve killed plenty of gobblers in pouring rain, or just after a rain, so if you can stay out there and not be miserable and wet, you have a good chance of filling your tag. Spring not only gets the turkeys moving, it also has ticks and other biting insects looking for a meal. With the prevalence of Lyme disease now, it’s a good idea to have a plan to lessen the chance of getting bitten. If you like to pre-treat your clothing with a deterrent like Pyrethrin, get it done now and store the clothing in a sealed tub or container until it’s time to go hunting. I’m not a fan of using chemical treatments, but Pyrethrin is a natural substance and having witnessed the effects of Lyme disease on several of my friends, I’ll gladly use it on my clothing. We all seem to have a favorite turkey vest. Like most turkey hunters, I have several, but one or two are my “go to” vests. If you’re like most of us, we don’t clean our vests out after the season is over and it ends up getting done the next year. I’m as guilty of that as the next guy, but I always manage to go through mine before opening day. It’s a bit like a treasure hunt. “Oh, that’s where that flashlight went.” “I thought I ate that granola bar last year.” Clean out the junk and examine any calls you find to see if they’re good to go. Check zippers and buckles for operation and again, does this thing still qualify as camo? Pattern your shotgun. 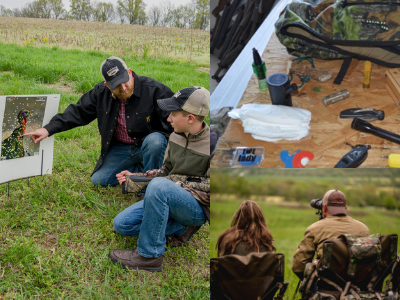 Sometimes we only shoot a couple of turkeys each spring, so it’s good to know how your gun patterns, as well as being familiar with the recoil. Shoot from the same type of set-up you use when hunting so practice is realistic. I generally hunt with some sort of stool or “turkey chair” and a shooting stick, so that’s how I set up for patterning. It’s especially important to pattern your gun if you change loads. I have one gun that prints 12” higher with tungsten loads as opposed to lead shot. I found that out the hard way by shooting over a gobbler at 20 yards. Get decoys out of storage and clean them up. Do any necessary maintenance and make sure any carry bags are in good shape. A lot of hunters use Jake or full strut gobbler decoys now. If you’re one of them, you need to have a safe way to transport them in the field so you’re not mistaken for game. If you hunt from a ground blind, get it out and set it up at home. The last thing you want to do is to be trying to put it up at your hunting spot, only to find a pole broken, or that a family of mice decided to spend the winter chewing holes in the fabric. Spend as much time as possible scouting before the season. Just because there were birds there last year, doesn’t mean conditions haven’t changed. I once went on opening morning to one of my favorite spots on a neighbor who gave me permission to hunt, only to find a shiny new mobile home right in the middle of the woods. He forgot to tell me he had sold that small piece of land – and I forgot to ask if anything had changed and if it was still OK to hunt there. Lesson learned, morning lost. Turkey hunting is one of those challenging sports that pulls you in and always leaves you wanting more. Being out in the pre-dawn hours with a toms’ booming gobbles from the roost, the hens softly yelping from the trees as the woods wakes up and the song birds begin to sing tends to set things right with the world and my troubles seem to fade away. Although turkey numbers are down in some parts of the state, Missouri is still one of the top destinations to bag a gobbler. Being prepared can make this spring an experience you’ll never forget.